IDCORE Research Engineers use the facility available in the Department of Naval Architecture and Marine Engineering during the module Physical Model Testing for Offshore Renewables. Kelvin Hydrodynamics Laboratory is the second largest hydrodynamic test tank in the UK. The tank provides excellent conditions for measuring performance of surface ships and a wide variety of floating and underwater structures. Ship models used are typically up to 4m in length. High-quality single-frequency waves and random sea-states may be generated with wave heights well over 0.5m. Motions of floating vessels and structures are measured using a state-of-the-art real-time non-contact infrared camera system. Resistance dynamometers for different vessel types and model sizes are available as well as a six degree-of-freedom dynamometer for force measurement. Up to 25 wave probes may be used to determine water surface elevation in the tank. A 3-axis fluid velocity measurement system is also available, and a PIV system is currently being installed. Pressure distributions on model surfaces can be measured. Above-water and underwater video systems are available. 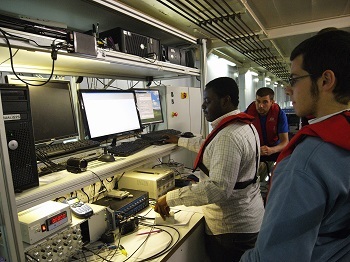 The tank is commonly used for a wide range of marine hydrodynamics tests including measurement of: ship resistance and sea-keeping; unsteady motion of ships and floating bodies; survivability of damaged ships; hydrodynamics of towed surface-piercing and submerged bodies; ocean engineering studies including vortex-induced vibration and vortex-induced motion; wave impact and slamming studies; marine renewable energy studies including device performance, maintainability and survivability; sporting fluid dynamics.